The Blue Springs South football team discovered that the undefeated Lee's Summit Tigers rely on much more than the strong arm of quarterback Drew Lock. The junior phenom, who reportedly has been offered a combined football-basketball scholarship by the University of Missouri, completed 11 of 16 passes for 270 yards and four touchdowns in a 35-25 Suburban Big Six victory over the Jaguars. But he had a strong supporting cast as the Tigers’ running game and special teams played a huge role in Lee's Summit's sixth consecutive victory Friday night at Larry Stewart Memorial Stadium. 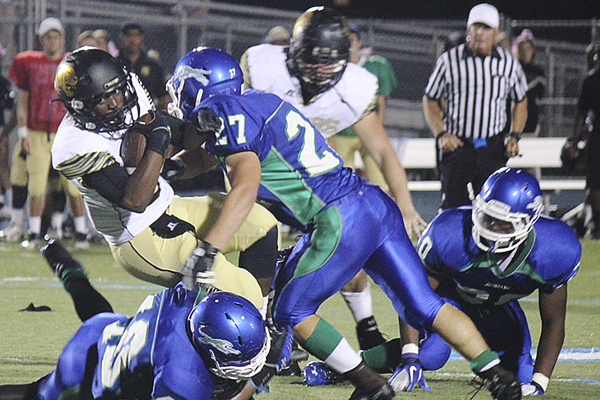 Alonzo Page carried the ball nine times for 134 yards and Casey Slaughter added 83 yards on 17 carries. But it was the Tigers' special team play that had everyone talking after the game as a Jaguar pooch kick was returned 35 yards with just 36 seconds left in the half and South trailing 14-12 (following a missed extra point kick on its first score and two-point pass play on it second). With 8.8 seconds left in the half, Lock then hooked up with Zach Mitchell for a 19-yard touchdown that gave the Tigers a 21-12 lead and a world of momentum. That comment was backed by a 15-play, 85-yard scoring drive that culminated with a 5-yard touchdown pass from Colton Pogue to Briley Moore-McKinney with just 14 seconds left in the game.